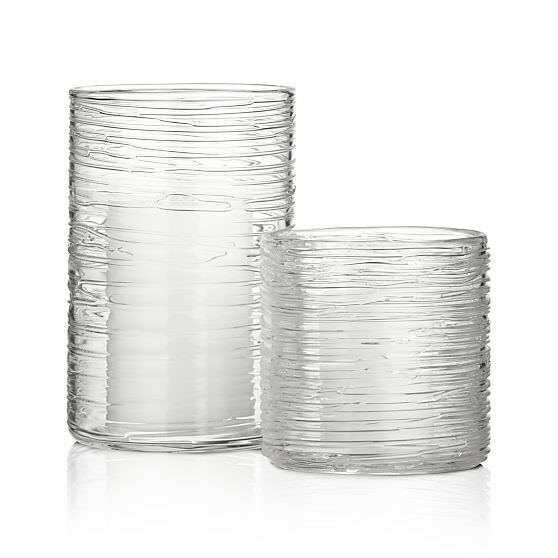 I love Crate & Barrel, and I recently had a yearning for their Spin Hurricane Vases from the catalog. However, even the small one retails for $24.95, so here is The Budget Decorator’s hack of the Crate and Barrel Spin Vase that only cost a little over a dollar to make. 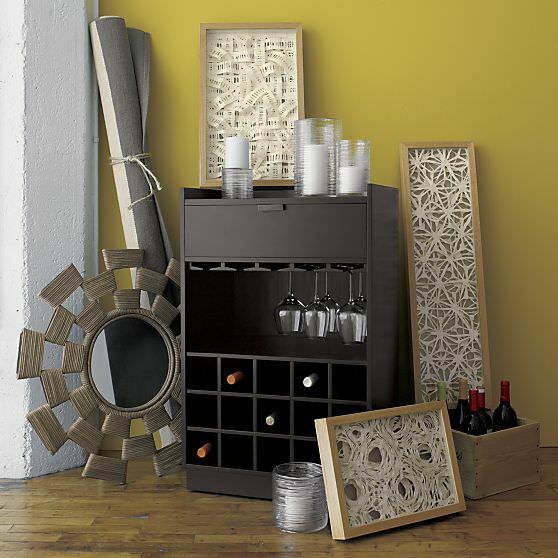 The 3 photos directly below are Crate & Barrel’s version. Using a hot glue gun, create, or “spin” a line of glue around the outside of the circular candle holder in a continuous pattern. Although I did it alone, if you want a more precise look, it may help to have someone turn the container for you while you apply the hot glue line. You can either start in the middle of the container and work your way toward the top and then start again and finish to the bottom, or simply start at the bottom and go all the way up. Its fine to have to stop and restart, the effect of having it uneven is wonderfully organic. Try to keep the lines tight, but not too tight. 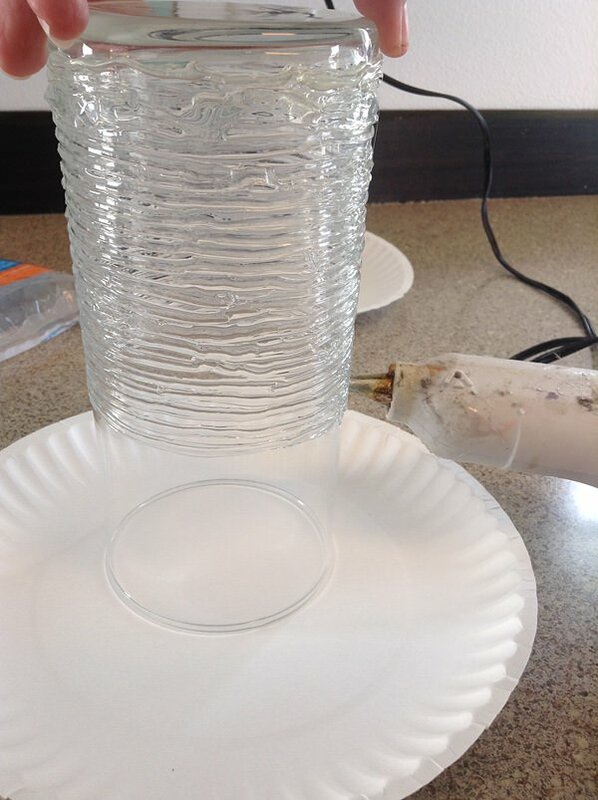 I found if I touch the tip of the glue gun to the vase, and push the tip ahead of the glue, I got a pretty smooth line. But again, this is an organic project that isn’t meant to look perfect, not even by C & B! Tip: If you are seeing uneven globs of glue, it’s fine to work the tip of the glue gun back and forth to even them out while the glue is hot. Allow it to cool. 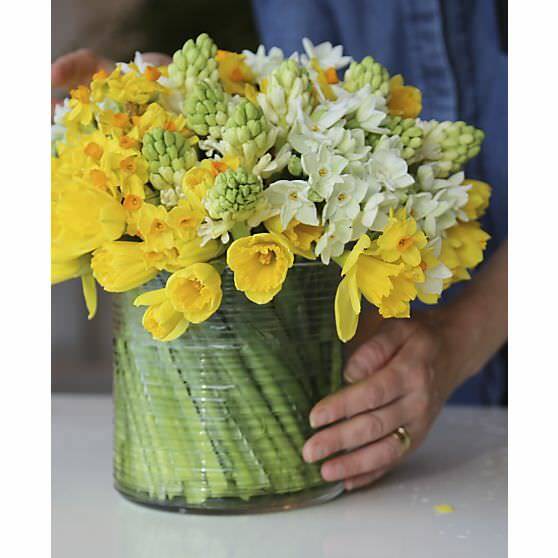 You can also do this with a smaller circular vase as well, just as Crate and Barrel does. Make sure you hand wash it gently with a damp cloth. Done! 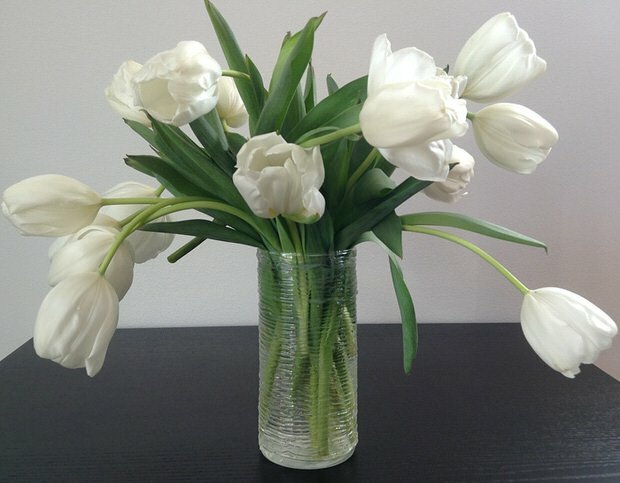 Fill with candles, flowers, or even make a row of them to stand alone as contemporary art. Tip for Scaredy Cats: You can always practice your glue lines and technique first on a piece of wax paper wrapped around and taped to the candle holder. Also, remember, its a dollar store container, not a priceless antique, so give yourself permission to make a mistake. Here’s TBD’s version! 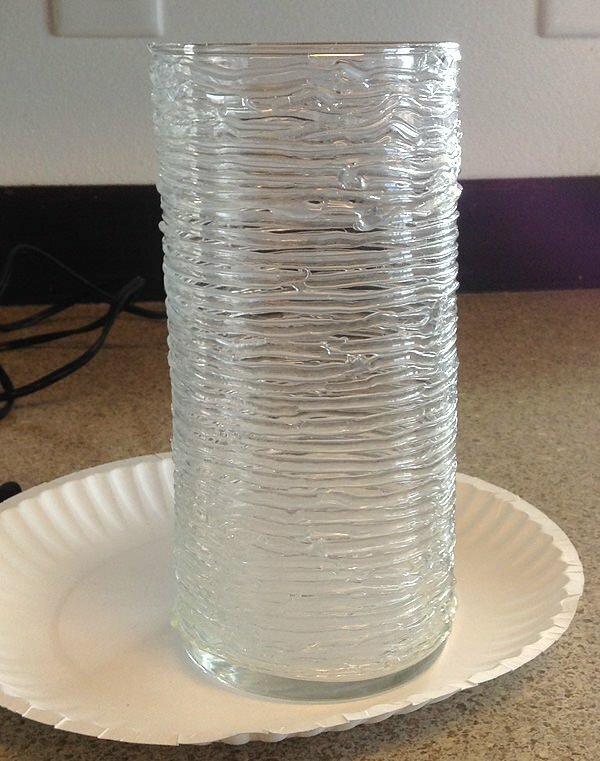 We are pretty dang proud of this hack project… it looks about as close as you can get to the original vase! 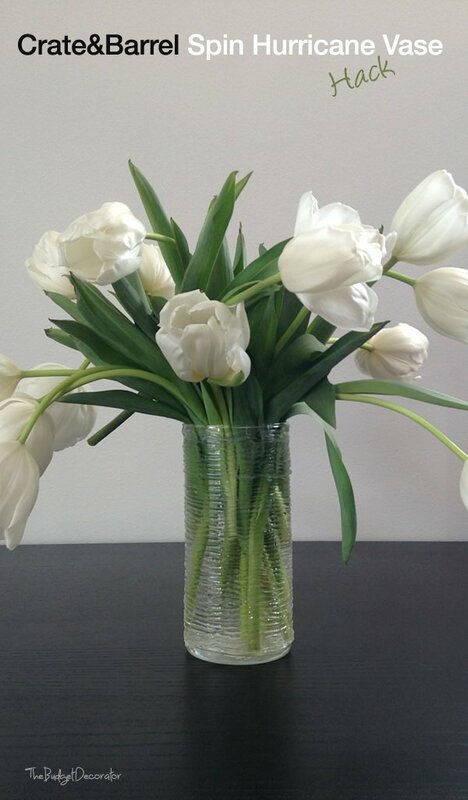 Think your vase looks even better then original. Could you use a lazy Susan that you get to put you r can goods on?It turns easily. I love the simplicity of the project as well as the results – very pretty! I love this! This is too clever. Yours looks just like the Crate and Barrel one! Love this idea! Yours is just as beautiful as the original ones from Crate and Barrel. That really does add to the look of the vase! Great job! 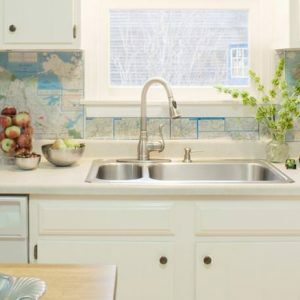 I saw this post today and immediately pulled a hard water etched vase out from under my sink and got out my hot glue gun. It turned out beautifully! I love it! Thank you for this, it also saved a vase that otherwise would’ve been thrown out. Thx for sharing how your project turned out! How about a Lazy Susan? Would that work out as the second person? I really like this project. Can it also be painted? I suppose it could! Using one of the new all in one spray paint products that have primer included. Let us know if you try it and send us a photo! This is a fantastic project. Great thinking! Can also try it with colored glue sticks? Thats a good question… I don’t see why not? Let us know if you try it! Filing this away under “Why didn’t I think of that?” You really can’t tell the difference between your hack and the C&B version. Brilliant!! This would be a great use for the glass jars my instant tea comes in. 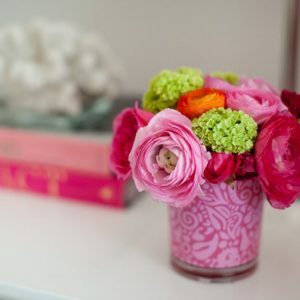 I have used them without decor as vases before. Job well done!!! Thanks for sharing!! Since summer is coming to an end, I will have no outside projects!! It is good to find small, inexpensive, that look expensive, projects to keep me busy during the dreary winter months!!! Thanks Again!!! Happy Blogging!! Although this was a while ago, I thought I’d suggest a rotating cake stand for projects like this. I’d say these stands are a must for any crafter who works with larger objects. They can be got for about $10 and make it possible to spin the object and work on it at the same time. Just be sure to lay some paper down so the surface will stay clean and flat, and I think you’ll be happy with the time and bother you save!